TonyFromOz reports that the first generator at Hazelwood Power Station has stopped after 53 years of operation. Hazelwood Power Station, closes, March 2017. Photo David Maddison. At 1.51AM Monday 27th March, Unit 8 was the first Unit at Hazelwood to shut down. It reduced power at around 3.45PM on Sunday afternoon from around 170MW to between 128MW and 134MW, trying vainly to stay operational for as long as possible. At 11.05PM Sunday night, power started falling even more, leading me to believe it was starting the shutdown process, which took almost three hours. Power fell off over the next almost three hours and finally, it stopped generating at 1.51AM on Monday morning. At the end of Sunday, Hazelwood had generated 14.8% more power than every wind plant in Australia over the last 28 days. That extra 14.8% amounted to 129.696GWH, enough power to supply the 24 hour needs for 265,000 Australian homes for those 28 days. TonyfromOz has been updating his record of the last month of the Hazelwood plant here. I wonder if these dimwits who ordered the shutdown, have truly grasped whats going to happen in the long run? Its all “fun” and silliness, until the sheep wake up…..
It’s all about plausible deniability. No one who caused the closure has any idea why it is closing. A mystery. As Malcolm said it is a private company. Daniel Andrews says the 300% rise in the coal price was long overdue. Both are very sorry about the loss of jobs. So why does a company walk away from a boom market with record high prices and no comparably cheap volume 24/7 competitor? Malcolm has no idea. Bill Shorten has no idea. Daniel Andrews is saddened. Rubbish. Their denial is not even slightly plausible. Plus the management, workers and engineers have done an amazing job destroying the myth that the plant is old and faulty and unreliable. Well done all! No one can hide behind this excuse. Devastation of our country to please the few Green voters who hate coal but don’t mind diesel. I can’t find adequate words to describe how angry and upset I am and how much I despise our ‘Dear Leaders’ for what they are doing to us. I think their actions are treasonable. How can their combined actions from both major parties be treasonable when the vast majority of the public actually approve of their actions? If the public really thought otherwise we would see by now a massive swing away from ALP+Greens federally given they are the worse of two evils wrt coal. The Greens actually want to shut down all coal fired power stations and stop coal mining full stop. Instead we are seeing the opposite trend. Australians are fools. Treasonable because the powers that be know jolly well that Australia will end up in a bad way. They are the ones that have knowingly and wilfully engineered this situation. It doesn’t matter what happens to the country just so long as the polis’ have lined their pockets. Yes but that assumes that most voters prefer politicians who are honourable and logical who strive to do the right things for the nation and who are not so focused on being popular and career politicians. The voting patterns of late prefer the latter type of politician. Hence my remark the real fault is with the voters not the politicians. It’s a PIG Snout In the trough! Sorry Annie, but the powers that be DON’T HAVE THE INTELLIGENCE to know anything. They have made that patently clear. Andy, who are these “powers” that you speak of? The people who are getting what they want from their deigned plan are the Marxists, who intend to abolish all private management of industry, no matter the cost for the people. And our supposed scholars, e.g. Malcolm, can’t see it. You have to ask, who wrote the text books when scholars like MT believe that this issue is a private matter. Blxxx predictive text + old eyes. Designed. IMHO you have to view history as either accidental or directed ( and maybe a bit of both occasionally ). Based on evidence I have seen over my life, a lot of it seems to be directed. Pollies just do as they are told, they are in many ways no better than working dogs on a farm…go way back….go way back….speak up….woof! Some pollies have brains and use them, a lot of them dont seem to. Ergo, I suspect that the shutting down the power station is a directive from those who really run the country, and the pollies have stayed Mum. I guarantee you there have been rumblings in party rooms etc, but dissent has been silenced. So the reality I suspect is that they know full well whats going on. The great thing about pollies is the average mug punter looks no further than them, rather they need to find the king makers and secret societies and the people in the shadows who direct the whole mess. And dont forget pollies are sucking up to the UN big time, and the UN is an occult pagan human-hating extreme green organization…you tell a lot about people by the friends they keep…. Get solar for your house and buckle down, unless we have a nikoali Ceasceu moment, this NWO lunacy will continue on for some time…..
That’s as maybe OriginalSteve. I don’t disagree with you there BUT the pollies have a moral choice and they would seem knowingly to have made choices that are so bad for the country that, to me, they are treasonable. I think that even people who arent that smart still know right from wrong…. Treasonable because they are deceiving Australians and jeopardizing their economic security, energy security which underpins our lives and livelihoods and even our personal safety at airports, in elevators and on aircraft and in hospitals and driving. Treasonable because they pretend not to know why Hazelwood is closing when they are the sole cause, so malice aforethought. Then pretending that it is an unknown commercial problem when they are clearly and solely responsible for forcing the closure. Pretending that there is adequate supply in the system when the country is put on public notice by the AEMO that this closure makes the whole Australian electricity grid critically fragile. This is just to quote our Prime Minister who has said there is plenty in reserve to cope with closing 25% of the power in Victoria and it is just an unknown business problem for private owners. So when someone dies on an operating table or cannot have life saving surgery or crashes at failed traffic lights or a plane cannot land, our politicians are guilty of treason. TdeF, I agree it is treason but it is being done with the full consent of the sheeple. Once the people give up the obligation to be vigilant over their leaders then they cease to get a democratic system and they deserve whatever they get. This “sheeple” NEVER agreed to this farce, I’ve been wide awake to the inevitable result of the green blob bull**** of RETs, “carbon” taxes etc and never voted for any of it! Once one of the sheeples kids dies on the operating table due to power cuts, then they will change thier tune. in Athens on the Torrens. Captured the whole thing in just a few words. The vast majority, as you put it, don’t approve. Nor do they disapprove. Most of them don’t have a clue this is happening. Politicians depend on this. Or should that be nope. Most of them don’t have a clue it’s happening. When they get caught in a lift next month they won’t know why: and maybe blame the lift company or even Donald Trump. Of course most of the readers on this blog are very angry, but nothing will be done until the populace rise up after experiencing continual blackouts. Nothing exposes the reality so well as power outages to the general public. So the sooner this happens the better. Then we will be able to fire all our useless politicians and bring in technologists with sensible practical measures to restore Australia’s power independence — which I fear will take time to put into place after the devastation caused by LabLibGreen policies. Turnbull and Shorten are the only problems – the voters are too. Apparently they hate coal too. Otherwise there would be street marches by now given the ever increasing electricity and gas prices, plus a massive swing away from ALP+Greens instead of towards them. What’s really ironic is big business doesn’t appear to care either but then again they just just pass on the higher costs to the consumers. Australian voters are fools. I wouldn’t say that Australian voters are fools. Despite what Poms and Kiwis say, your average Aussie is pretty sharp. What they are though, are social animals. They like to do things in groups, and follow the group consensus, and be seen as a team player, etc. While the mood is sanguine your Aussie will keep his (or her) head down, and watch developments. Right now, this is just a lull before the storm. Once the real implications of the shut down bites home, and the “renewables” are shown to be inconsistent, and the real costs of “renewables” is reflected in the regular house electricity bills, then the group mood will change, from sanguine to coldly angry. And when an Aussie gets coldly angry, they get very efficient at exacting retribution. I would not want to be down-range. As much as the voters have behaved poorly–deludedly–while the dismantling of our civilization has progressed, they can only be expected to behave even more poorly when they finally “get angry”. I don’t see that they have been “pretty sharp”, and I don’t expect them to be so in the future. With the SA blackouts so far, and the closing of Hazelwood power plant, Turnbull and the other dissembling politicians should already be indicted, and soon on their way to prison (just as Obama and all of his enablers should be in the USA). You have to wonder wbout how such tech arose and its timing ( Centr*l*nk, FB, twitter are mass surveillance tools ) – I see it as a tool that will be used for much evil, but only because the average mug punter suffers under the illusion that having a smart phone means they have power..they dont..t.hey are just recepticles for whatever rubbish they subscribe to….. If the voters were not fools but sharp then semi-useless Abbott would still be the PM instead of the totally useless Turnbull. There is no due diligence, so we can expect some kind of class action when the sheepl wake up. Unfortunately they are not listening but when it all turns to a mess, politicians will find out — ‘Chasing Sheep Is Best Left To Shepherds’. This shutdown is another demonstration that the Warmists are still winning, even if they have proven wrong countless times. It’s a slow motion suicide. At its maximum power generation over the last four weeks, Hazelwood was generating an average of 1377MW. The average home consumes 17.5KWH per day, so, at that maximum, Hazelwood would have supplied ALL the power requirements for ALL 24 hours for 1.884 MILLION homes. Not to worry mate. This’ll fix it. At 2.25PM Monday, the third Unit shut down. This one only took 45 minutes to get back to zero. Three down and three to go. I have a screen image at my site taken at 3.35PM on Sunday 26th March, the last time Hazelwood Power Plant had all eight Units operational and delivering at the maximum power they were capable of generating at that time, and that was 1320MW. Unit 8 fell away a little after this, and at 11.05PM they started the shutdown for that Unit, and then the second Unit this morning at 8.05, (back to zero at 10.10AM) and now the third Unit gone down. I also have two screen images from AEMO indicating price spikes at the closure times. Joanne has the link to my Post in her text above. Cut to a scene eerilie reminiscent of a clutch of apocalyptic movies recently….people walking in, see the old gens sitting idle….thinking maybe they can pull society back from barbarism if they can fire up the turbines….gun fight ensues….ferals living in the power station subdued, fireup begins…. Interstingly, at this point, no hint as to whether any form of govt exists…. Sounds like a variant of “The President’s Man”. Unit 2 going down now, and Unit 7 not too far behind that. It’s like watching the vital signs of a dying patient. Unit 7 has shut down, and one more to go today, and the last two Units tomorrow. Those remaining three Units are currently generating 492MW. Just in the same State, Victoria, there are 15 wind plants with a Nameplate of 1485MW, which is three times the current Nameplate of Hazelwood at that 492MW. 15 wind plants with (around) 850 turbines on poles. The total power being generated by those Victorian wind plants is currently 340MW, the same as for two of those remaining three Units at Hazelwood. Wind power – abject failure, not just today, but every day. Also, let’s have no more talk about firing up this relic again. That ended at 1.55AM on Monday morning when the first Unit ran down. They purge the system and the huge weight of the generator’s rotor settles on the shaft, making it impossible to start up again, without horrendous amounts of money being spent on every part of the process, the generator, the multi stage turbine, the steam pressuriser, the steam generator, the furnace, the pulveriser, the feeder. All now silent for five of those eight Units. No need to dynamite the stacks. That’s just an ostentatious display for the greenies to cheer at. Let the real talk now begin on HELE. Unit 5 went off line at 4.45PM. That leaves two Units left, both to stop tomorrow. Total from every one of the 15 wind plants in Victoria – 200MW. Add in Hazelwood and coal fired power is delivering 3700MW. Victoria is currently consuming 5310MW. So, umm, wind is supplying 3.7% of what has now become the second highest costing electricity in Australia. A friend of mine, a highly qualified Engineer with years of experience in power generation, wrote to one of the senior managers in Engineers Australia about an article published in Courier Mail on the week end. Here is the body of his letter. Enjoy! “I read an article on the Courier Mail (Sunday 36 March, page 21) by EA energy expert Marh Lendith and felt that it sadly missed the mark in regard to the current crisis in the electricity supply industry. The article is loaded with meaningless statements which simply mislead the non technical readers of the newspaper. For example…. Why not state the current state of our coal fired network is a result of poor planning, commercial uncertainty, privatisation and an utterly hopeless National Energy Marketing plan? Instead of saying we need a national transition plan, why not point a very large finger at the marketing plan, which was devised by academics with no real life business experience, and needs to be completely overhauled. It contains the main elements of the American system which was a total disaster and resulted in around twenty EMRON executives serving prison time for fraud and market manipulation. Such market manipulation was evidenced in the SA debacle and is evidenced every day of bidding. Why not question the lack of wisdom of allowing renewables to be installed without supplying the attendant essential spinning reserve! And why support a system which gives a preference to renewables over coal without penalty yet the coal stations are essential to cover the sixteen hours per day when the sun doesn’t shine and the wind doesn’t blow..,…. No, not even a slight reference to this absurdity. Only a reference to the fact that the old existing stations are very very dirty!!!! That by the way is a load of nonsense! No support for the Trevor St Baker idea of extending the life of Hazelwood? The looney left can say what they like and are never challenged? Why is that so? No merit in buying some time? Not a mention of the need to supply reliable spinning reserve or where it will come from? That my friend is the elephant in the room…. :then we get to the arguments put up by Dr Stocks, a complete academic who had “modelled” battery back up into his renewable computer model. Stocks is talking academic nonsense…he was instrumental in developing such a battery, which appears to disappeared of the radar. Musk is a sharleton who has a trial system of 499 MWHr capacity in California I think….. His system is hopelessly inadequate, unproven and hideously expensive. Then there is the academic who made a submission to Finkel et al, that we could use pumped storage as back up! What utter academic nonsense. Why does EA not run the numbers….. Cost it and size the dams etc….. Find big enough hills to accommodate the required sizes! Don’t just mouth the establishment feel good nonsense! Why did Lenich not point out the stupidity of the Musk battery offer! Six minutes till lights out……how useless is that. Then he supports more renewables! Nonsense….. What about more spinning reserve to back up every renewable system supplied…. Paid for by the renewable facility. I guess the plan is to bludge off the Fossil fuel stations while continuing to skim the subsidised cream from the pond. In summary, I found the article to be useless and misleading. Why not mention that there hundreds of coal fired and fossil fuelled stations being built around the world in the immediate future…. Countries include Japan. Germany, India, South East Asia , China ( after a pull back for twelve months to adjust for oversupply), America, and many more…… Look them up! It’s all on the Internet. So as a minnow in the whole scheme of things, why do we stand by watching our economy be destroyed? The link below also makes very interesting reading. Righto. Let’s get it done. Close it down so that Dan Andrews can dynamite it. The sooner we enter the dark ages and re-learn all about technology the sooner we will get back to the industrial age and from there it is a mere couple of centuries to get back to where we are now. The sooner we start the sooner we finish. Still got 605 days until the next State Election. Watch out for a spike in cricket bat sales just prior. However, the idea that Andrews will resign is risible. The man has the hide and sensitivity of a dead rhinoceros. How else could he be suggesting gender neutral teachings to eradicate ‘sexist tendencies’ in FOUR YEAR OLD’s, and maintain a straight face? It may be time for people to feel the effects of their bad voting, and bad decisions by those they elected. But not everyone voted for those who won, yet they suffer along with those who made mistakes in their voting. Nonetheless, it is sad to see this happen. People will suffer and have no immediate recourse to stop it. And worst of all, it didn’t have to be this way. Before we be too harsh on voters remember the role the ABC and other media plays in informing them. Is it the fault of voters if they live under the illusion that the ABC is fulfilling its charter and giving them the whole truth and nothing but the truth? Does anyone think that if The Age and the ABC did not have a blanket ban on publishing views of skeptical scientists that the voters would be marching in the streets today? If we shut the ABC and used that billion dollars to subsidize electricity, sadly it still wouldn’t cover the cost of the damage of the incompetent, biased coverage. That’s true Jo…we know good and decent people who believe all that rubbish. However, I still deeply resent that their lack of investigation into the truth is going to affect so many people very badly. The ABC and Fauxfax have an enormous amount to answer for. Maybe Jo, but if the plod pull you up for speeding ( or a bunch of other things ) they always say ignorance of the law is no excuse. Ergo, people can be informed if they choose, can dig for information if they truly want it. Yes the media is very effective in its role in being heavily one sided, but people have reason and brains, if they choose not to exercise it, Caveat Emptor, IMHO…. Disagree, we have lost a generation through sophisticated propaganda based on one big lie, political correctness is part of the mix. Traditionally people have faith in the ABC and trust them to be fair and balanced, unfortunately the newsroom has been taken over by pseudos. Imagine a world, not too far off, when Aunty acknowledges they got it wrong on climate change and this distorted our whole economic market, particularly energy. As Jo said, the organisation is ‘not fulfilling its charter’. Once again I call for caution. The ABC can be dismantled after they admit fault, otherwise ordinary people might think its a Murdoch conspiracy. Apparently, according to the left wing wits, Fox News is already running America. Once the 20 somethings become parents, they will change thier views. Conservatism favours families, not Godless PC socialism. Its one thing to be a trendy lefties at the local cafe to mutter evil against something thye know sweet little all about, its another to have to pay monsterous power bills, childcare bills, petrol and gas bills and have to pony up their prescribed hour of hate to the carbon-rich economy that provides their mobile phones and tweets and hot showers….at that point soemthing clicks and the backlash will truly start, as they recall one day talking to a Sceptic who exposed the scam to them…. It’s all about the brainwashing; people just don’t have the true story. I blame the ABC and I shall never forgive them. One day they will be made accountable. In regard to the ABC, if you saw the 4-corners program “The Age of Consequences” last week you would have seen a disgraceful appalling misrepresentation of science. They should have put an equal and opposite view on climate, drought and civil war this week but of course they wont. Is there anything we can do to lodge a protest against this very bad documentary being presented without any objective balance? The ABC don’t seem to invite critical comment on their 4-corners programs or have I missed an ABC web-page location where I could do just that? Yes, we have the same problem here the MSM is nothing but an appendage to the Democrat Party (left). And, it gave us Obama and a big step down the road to Socialism. And I hope many here in the USA remember why they voted for Obama and come to regret it. Some already regret their votes for Obama, and I hope many, many more come to the same conclusion, because at some point common sense may come to them. Sorry, I did not mean to offend any one in SA or Australia. Nonetheless, as long as we have freewill, we are all individually responsible for our vote. That is my opinion and it is based not on my sure knowledge, but of my belief system. Thank fully we have many conservative news web sites here in the United States, plus we have Fox news and Fox business channel. Australia needs the same thing. I have asked a couple of times on Breitbart, in the comments, to Australian based commenters, if there is any equivalent to Breitbart Newsin Australia. I was told that the closest thing is this site, and Andrew Bolt. Sorry if I offended you or SA voters. That was not my intent, my intent was to express sorrow for those who did not vote for the politicians causing these problems, and to chide the voters who did vote for the politicians wrecking the power grid in SA and maybe Victoria–they should have seen the problems developing. I know the media in OZ and here in the USA are biased and corrupt. The MSM in America are appendages of the Democrat Party (Left in USA). Nonetheless, it is my opinion that once a person gets to the voting booth, they are ultimately responsible for their vote. Hey Leonard, down here one doesn’t give offense, the weak minded lefties just take it, whenever and wherever they can. Especially offensive to them is the truth. The green-left just can’t handle it. They’re snowflakes. They’ve got “chips on the shoulder” syndrome. Just keep knocking them off. Australia is a sick nation. Here we are gradually closing down our only reliable source of cheap power while the rest of the world is building more and more coal fired power stations as well as renewables. If this keeps up the crash and burn scenario for our economy will come to pass sooner than most people think. Then perhaps Australian will wake up – but then even then I have some doubts. We may have been the lucky country for a long time but we are certainly not a clever one, especially since so many still vote for ALP+Greens, which happens to be about the most economically destructive political group in the world. If we were semi-smart, the vote for the ALP+Greens would be a fraction of what it is now despite the likes of Turnbull. Common sense and logic would dictate that even a fool let alone a smart voter would vote for the lesser of two evils not the greater. I have a very low regard for Turnbull but if Shorten and his friends the Greens get into power then it proves beyond any doubt Australians are the biggest fools in the world and deserve to get whatever comes. I still don’t get it that such a piss ant little country of some 23 million people like Australia. Has to be “volunteered” by our politicians on our behalf to save the world. Yet the world we are “saving” continues to burn our coal. While we continue to blow up our “burners”, creating an energy poor! Volunteer yes but not by our politicians – by the voters who vote for them in particular the state level. SA is the prime example where the people appear not to be concerned about having blackouts. The NWO always do stuff on a small scale first, then roll it out globally. Apparently everyone returning to Oz from O/S soon will be iris scanned like common criminals in Minority Report …. apparently they did thsi to very male in Iraq…Iraq was the test bed for a lot of this NWO surveillance tech…. DO you reckon the sheeple will complain they are being forced against their will into a biometric database? Not if they can get off their nut in Bali and sleep it off coming home….reckon that data will stay in Oz? Its for our “protection” of course…and dont forget the 6′ fences aroudn all the primary schools as well…. Nasty stuff is coming, ignore it at your peril…..all the signs are there….this is pre WW2 Nazi Germany all over agiain. Whats really ironic is that we shut down coal power plants and wont build nuclear ones. But we have no problem selling coal, gas and uranium, which someone will either burn to create CO2 or Nuclear waste. Here in SA we have a stable geography and the 2nd biggest uranium mine in the world – we should have really cheap power. In the meantime the lives of those of us who can see through all this appalling rubbish are also being mucked up. Thanks, all the nincompoops who’ve led us to this. Australia will end up one big stuffed Tasmania. People nee to put solar on their roofs….and learn how to get it to run stand alone while isolated safely from the supply from out in the street…..that way if the grid goes down due to shedding, their house will stay operational. Actually if you check there are less coal fired stations being built. China is now building more renewable power stations and are closing thier coal fired ones. Germany is building more renewable stations and closing thier nuclear plants.There are plenty of storage solutions available beside batteries. Liquid Sodium Chloride and Liquid Silicon that can be built in months that will stabilise the power grid. The coal industry is so corrupt it paying off the politicians that are currently in power.The reason that renewables are not popular is that the pollies cannot line thier pockets. Elon Musk represents the future, he will lead the charge. Not only a big battery and also he is interested in using the Holden plant to build batteries and solar cells.Coal kills it posions the atmosphere. Actually Stephen your full of it. You really need to check your research. India commissions a new coal fired power station every week as does China. Japan is building new ones on a regular timetable to replace its shut down nuclear reactors. China who hax declared a “limited moritorium’ on their plant building for 12 months.That ends later this year. That “moritorium” reduces plant commissions from three a week due to over supply to one a week. All the above exclusively burn our coal! They went into panic. As their knee jerk reaction in shutting down their nuclear to Japan shutting it’s reactors hit home. When realizing their new beut green energy was blacking out substantial parts of the country and their main coal fired generators threatened to pull the pin because of restrictions placed on them. (read Adelaide and Victoria) They built seventeen new coal fired generators in the last five years! With more as future options. Both Japan and Germany right at the minute are debating not wether but when to bring some of their reactors back on line to pick up the shortfall! In Japan case it is one reactor. Germany is highly likely to be more. Then we have America and I’d suggest you watch this space as it ramps up its coal fired generation. Yeh, your full of it Stephan. Do not expect the USA to bring coal more into the power supply situation. With the increasing amount of gas (think fracking) there is economic pressure against coal. The Trump administration intends to allow more wells in more places. While coal gets much media attention because of things Trump has said and the depressed Appalachian Region, the area was, is, and will remain a troubled land. Getting people to move out, along with better education, will be more beneficial than trying to get miners back to work. Long term, say beyond 20 – 30 years, things may change. Twenty or thirty years is a long way down the track. If the mines start moving and as the restrictions on emissions are removed. Which is already happened. Then coal fired generation becomes financially viable. Cheap even! Like I said, watch this space. You Stephen are a true dope. Grow up and do some thinking for yourself. Elon Musk is a subsidy sink and a planet plunderer. Despot Dan pulls the plug on Hazelwood . Its back to medievalism and the dark ages. Boy does he and his whole scammist bunch of rorters need ousting, or what ! That’s ousting, prosecution and heavy jail sentences for such an act against the people of Victoria . A new slogan for our car number plates…’lights out are us’. Victoria and SA, “states of darkness”. Thanks to Jo and Tony for this report. I totally agree! If I thought my (adult) kids would take any notice of me. I’d suggest that they plan to emigrate to NZ. But they think I’m just a senile old fart with ‘far right wing’ views, so they ignore most of what I say about politics, economics and CAGW. I fear for their future. Yeah funny how the oldies actually have seen more of history than the young things and know what they are on about…. Guaranteed, when it hits the fan, and it will, the oldies are a font of knowledge the younger ones will come looking for….assuming the Politiburo dont order our detention ( or worse ) first to stop that. I’d suggest teaching the younger ones basic campcraft and survival skills, the sort of stuff you might need to survive a grid-down situation as an insurance policy for their survival. That and teaching them the reality that green communism is a society death sentence…. It’s probably the first time I would cheer is corporate giant Engie/Mitsui took our Australian governments to court for breach of faith with the sale of Hazelwood. Sure, the deal was done by another Government, but like the East West link, Engie not only paid $2.399 Billion but spent at least another $1Bn on maintenance only to be forced to close by laws which punished coal and gas producers plus extortionate rises in the price of coal and continual public attacks on the plant as ‘old’ and ‘dirty’ when it is neither of those things. At the very least they should get their money back for the 20 years the lease has to run. Compensation for loss in renovations too. Plus the losses made by being made uncompetitive. It might be a field day for lawyers, but this is a democracy, not a communist country. Similarly with Daniel Andrews making Heywood, the nation’s biggest timber mill unviable by drastically reducing the forest allocation allegedly to ‘save’ the leadbeater possum which is not threatened. So no timber, no manufacturing, no farming, no mining, no coal use, no coal exports to India (stopped by the previous Labor government), no fishing, no agisting cattle in the high country, no fracking, no gas exploration, no factory ships, no east west link, no volunteer CFA. Is there is nothing the Andrews government can’t damage or stop on behalf of a few fringe voters and his Union friends? Daniel has already threatened to buy the Heywood, without the owner’s permission being mentioned. What’s next, communist nationalization of Heywood so it runs at a loss, like everything else? Why not address the drop in VCE Science students from 25% to 6% under a Labor government? Does Andrews feel threatened and intimidated by Science people? Why not just sue them under 18C? Or just turn off the power. Plus not putting the trains under roads in opposition electorates where they will be put up in the air as a warning to Liberal voters not to mess with the Labor Green party. Then I thought the Labor Green party was against bullying? Clearly not. Labor , green , communists – all seem to be the same. The genuine harmless peaceful greenies who really do care are goiing to be collateral damage when the dust settles unfortunately…. I know I’ll be unpopular in some quarters for saying this, but frankly I don’t give a ‘@#$’ for any possum if it means my fellow citizens are suffering the loss of their jobs and means of living. I happen to think that human beings are of high value (except maybe politicians and the pseuds who call themselves climate scientists) and, important as all life is, the well-being of the people of this country comes first. Sorry TdeF, but Engie would not have a leg to stand on, if they wanted to take on the Australian governments, and I doubt they would bother. Hazelwood was sold in 1996 to a consortium of National Power, Pacificorp, Destec and Commonwealth Bank. National Power were the majority owners and had the operating and maintenance agreement on behalf of the partnership. Over many years, the ownership changed and National Power progressively increased it’s holdings. In 2000, National Power (a UK based company) went through its own break up and the international company, which kept ownership of Hazelwood became known as International Power. International Power continued to grow its global portfolio and in 2004/05 acquired Edison Mission’s non US global generating assets (which also included Loy Yang B). In the mean time, International Power kept buying out the other partners in Hazelwood, as they each bailed out, eventually picking 100% ownership. In 2009, International Power was one of the top 5 global independent power producers, with 22 assets on its books, a good forward outlook and a bucket load of cash in the bank. Ripe for the picking. GDF Suez made its first attempt with an aggressive take over bid. The board managed to hold them off (just). In 2010, GDF Suez made another approach and this time were successful in a so called reverse merger. (I’m no beancounter, but it was a take over by a fancier name). Around 2012 GDF Suez invited Mitsui to enter as a minor partner for the Australian operation. (Should be noted that Mitsui had similar arrangements on selected assets globally with International Power). In 2015, GDF Suez rebranded to Engie and with a new CEO, changed direction to get out of coal based generation globally. Engie did not buy Hazelwood. Engie (GDF Suez) bought International Power (globally) that included a mix of good assets and not so good assets. (Ever bought a mixed lot at a clearing sale and had to sort the good stuff from the crap?). In the last 12 months Engie has closed a number of its older coal stations around the world, and sold off the newer ones. We see the impact here locally as to us it is a big piece of infrastructure that is going. To the head office in Paris, it’s just the next name on the list and they have already started to move on to the next power station, elsewhere in the world. It should NOT have been sold !! I do not favour redress proceedings, but I do not see how any of the points that you make impinge upon whether some legal action could or could not be successfully pursued. On take overs/mergers/buy outs it is usual for existing rights and liabilities to be transferred. The rights and liabilities of former owners are not usually lost or waived, and there is simply a succession in title. The new Owners succeed to the position enjoyed by the previous Owners. I would have thought that issues of time bar, whether there was any misrepresentation, whether the government had the right to change policies etc. are the determining factors. Whilst Australia is not a communist state, action against the state should be rare. At the end of the day, it is the citizens that have to pick up the tab since if the Government was liable it would pay the compensation, not from the pockets of government ministers, but from tax dollars obtained from the ordinary tax payer. Agreed. I am not suggesting legal action would solve anything but it would have the politicians running for cover. It might also extract admissions from the politicians that the are entirely responsible for the closure, not the operators. This has been hidden from the public, especially with the statements of Malcolm Turnbull and Weatherill who paint the operators as the problem. They even have the cheek to imply that a publicly owner power station would be prefereable, that it is the privatization which is the problem. They are able to deflect the blame from themselves. While the Prime Minister is prepared to call a Royal Commission on a single event, whether Turnbull or Gillard, it would be wonderful to have Turnbull answer for his action or lack of action on the one cause of the closure of 7Gwatts of baseload power, the RET. Either that or he has to feign total ignorance of the impact of the laws he supports while Tony Abbott is adamant that the RET has to go. The only hope to get this mess sorted out is to force our Premier and PM to answer to a court, to realise that their power is not absolute and you can only fool some of the people some of the time. It does not matter how many times it has been sold or partially sold. This was a 40 year lease to take over State Power generation in 1996 to 2036 with the implicit assumption that the State would not take steps to make the investment worthless. A deal is a deal. What the lesseee has is a worthless asset, made worthless by the vendor’s unilateral action where the lessee did everything in their power to support and maintain and operate the leased property and at closure it was performing perfectly. It does not matter if the vendor has changed political party or the purchaser has onsold the property, the vendor has the obligation to uphold the terms of the lease, explicit and implied. The idea that the lessee will just walk away from a $3.5Billion assett with 20 years to run let alone pay $1.6Bn for rehabilitation of the site is ridiculous. The only question is what Engie/Mitsui will do. If the entire Eastern Seaboard power comes crashing down, they will be in a very good position, as they are with Pelican Point. People will want action, not words from the politicians. After all, the elected representatives only have the power given to them by the people. As in the US, UK and increasingly Europe, people have had enough of the Media and the politicians running the country for their own benefit. Engie/Mitsui would have enormous public support in this as the politicans are forced to admit it is all their fault and in a court of law. Even the ABC cannot suppress that. Sorry, I’m a day late to the reply. There is no 40 year lease. It was an outright purchase of the power station, mining equipment and the mining licence to extract the coal. Other states went for long term leases when they privatised, but in Vic, Kennett went outright sale. The 2036 date was an ambitious target set by the then new owners, to drive efficiency improvements, as the original date to run out of coal within the original licence was 2026. It has nothing to do with any dates set by government. As the owner of the site and holder of the various licences, they are also responsible for the rehabilitation, which is why no taxpayer money is involved. Also need to correct some figures you quoted. They paid (or probably overpaid) $2.34 Billion for the business in 1996 and has been depreciating ever since. It’s not worth that much any more. The rehabilitation figure is nowhere near $1.6B. There is a figure of about $750M being quoted in the media, of which about $400M for the mine rehab. The real number will probably be less that that. Perhaps the reason they had Hazelwood running flat out for the last month even though they are losing money was to demonstrate that it was a viable power station contrary to the statements of Dopey Dan and Turnbull, so they would have evidence to bring to court if they decide to sue the government. What you vote for is what you get. Victorians are not slow learners. They will eventually wake up that it’s their fault. I never thought I would live long enough to ever see the day when our politicians defied every conceivable piece of logic and basic human compassion and belief in humanity and their once in a lifetime chance as politicians to be seen to be continuing to advance human well being and welfare by the continuing provision of that essential to human advancement and the very foundation of the success of our modern civilisation, cheap and utterly reliable electricity. Instead they, the politicians in their straight out callous and psychopathic level of disregard for the comfort and hopes and dreams of the very people they claim to represent have quite deliberately chosen to put human suffering and deprivation from the un-affordability and pending shortages of energy as a much lower priority than attempting to fall into line with a Cult of a Climate catastrophe, a Cult whose every single prediction and claim that it has made over the last three decades has demonstrably failed in their totality. Despot Dan of Victoria will now join at the first rolling blackout or full blackout with Windmill Weatherdill of SA in the annals of State Premiers as a couple of the most incompetent, compassion depraved and totally dismissive and disinterested of the best interests and welfare of their constituents out of all the premiers that have been a part of Australia’s history. Don’t blame the politicians at least not completely. It’s the voters state and federal who put them into power. Here we have the real prospect of the ALP+Greens forming the next federal government. Are we that stupid? I think we are. If we are then we deserve them. Crash and burn here we come. The Coalition/alp see saw game doesn’t work anymore. Choosing between DUMB and DUMBER is the the definition of stupidity, where repeating the same process is expected to yield a different result. TIME FOR A NEW APPROACH……..
Also agree. No matter who we vote for, they either get back-stabbed or bought out. Either way we end up always moving in the same direction. We CAN’T vote to turn the ship around, as every new captain turns out to be a remake of the old captain. It’s not our fault. Sometime in the future my red thumbed troll, you also will be sitting in the freezing cold of winter, in the blackness of the night with no heaters or gas , no street lights, no phones, no Ipads, no computers, no fuel for your vehicle as the service stations have no power for the pumps, no light to even read by. Or perhaps you will be sitting in the broiling heat, the food in your fridge turning to mush and going rotten, no phones, no computers, ipads, eftpos bank access or cash machines. No supermarkets open as they won’t be able to run their on line computer system. No trucks bring in fresh food as the fuel outlets have no power. No hot water, perhaps no sewerage as the sewerage system needs power for its huge pumps, no maintenance of essential services, as the maintenance vehicles need fuel from underground tanks which need pumps. No trains or trams or buses. No traffic lights so grid lock as the traffic snarls for the first day or so at intersections. Perhaps no ambulances as they also need fuel or cops when you need them most. Few doctors as they also like you and the rest have to find transport to their clinics but then they won’t have many patients either unless those patients can still walk a few kilometres. And if you have any semblance of intelligence, a doubtful proposition considering your reactions to many posts, and can over come your ignorant bigotry and think back to what that denier ROM and all those other deniers on JoNova’s blog was trying to tell you and your equally bigoted and ignorant fellow trolls, you just might come to realise if that is within the limits of your intelligence, that they were trying to tell you and the rest of Australia just what sort of future we were facing when the politicals and the greens and the media forced the closure of the great coal fired power generators that have done so much over the last five decades to give us Australian’s the life style only matched by a very few other nations on this planet. Of course you could always try and go stand under those wind turbines and admire the miserable and intermittent generation of power they generate. Thats if you can stand for more than a few minutes the health destroying infra sound that they inflict on the people forced to live within the kilometre or so of the turbines that despot Dan has allowed the turbines to go to around a country dwelling. By all means red thumbed troll, just keep on doing what you are doing and perhaps someday it will dawn on your your very limited intellect and stupidity that maybe it wasn’t those deniers who were wrong, It was YOU who was wrong! Very well put ROM. Thank you. Every now and then one gets a real good laugh around here. I build chook treadle feeders and sparrow traps for sale at our regional farmer’s markets. Both are quite popular with some 230 galvanised tin treadle type chook feeders built and sold over the last two and half years along with about 130 wire mesh sparrow traps over the last 15 months. A single sparrow trap a few metres outside of our back door where I feed the wild Crimson and Eastern rosellas and the native crested pigeons has caught 794 sparrows mostly juveniles, in just on 15 months. Being in Horsham city we have a near endless supply of sparrows so as I clean out one lot over a week or so, as soon as the numbers are down to a half a dozen temporary locals, a new squadron of around 30 each time is flown in to counter the previous losses. And we do the re-location job, trap included, via a deep immersion hydro therapy treatment all over again . Even the greenies around here laugh at that one! Well it seems that one red thumbed troll wasn’t enough to maintain confidence in the impact of their single red thumb. So they like those very juvenile and rather stupid young sprogs, had to round up another batch of like minded supporters to try and reinforce their confidence and keep those red thumbs rolling. Thanks red thumbers because as I understand it, it is the total of thumbs, not just green thumbs, that one gets that takes you into the rarified domains of the yellow comments . And the more your red thumbs contribute to my collection, the greater chances of a yellow comment status for that comment. These clowns with red thumbs don’t really know what it is like in a modern home with no electricity. Yes, people survived in the 1850′s with no power, but their lives were totally different to what we have today. In 2014, January, Newtown, Pennsylvania, we had 5 days of -4 degrees F, or -20 C, and then the power went off, the whole town was down. Fortunately the outage only lasted a day, but in that time, within 2 hours you could feel the heat being sucked out of the house. A fully insulated house with triple glazing. There was 600 gallons of heating oil in the tank in the basement, but it was no good to me as the oil pump, the forced draft fan and the ignition system run off mains power. In 4 hours, the temperature in the house dropped from 75 F (23c) to 40 F (4c). We had no lights, no phone (cordless), no cell service (I guess the tower was out), and no computer or TV. There was 3 feet of snow in the driveway, and 2 feet against the doors, so even if we had got out of the house, there was no way of getting the car out to go to a shelter. Fortunately, from my experiences in Queensland, (cyclones), I had an emergency kit, battery radio, battery flashlights, and a gas camping cooker. That afternoon, a neighbor came over and got us out with his snow blower. When in this situation, you feel completely helpless. People do die when the power goes off in that climate. Thank God it never gets that cold in Queensland. Thanks for that info Chris. I always wondered how long it would take a highly insulated American home to cool down in cold weather. In fact, I even asked my engineer friend in Hartford, CT, whose home I stayed in that very same question when I was there a few days ago but he didn’t know. Ah, but think of the green jobs and ecotourism, not to mention the youth centres, counselling gigs and employment/training bureaucracy. There’ll be a ping-pong champion or two coming out of all this. You mark my word. I can actually see the smirks on the faces of those greenies right now. Look at this radar image, at this link, of Cyclone Debbie in Queensland. I have kept the image at 256Km. Now, what I want you to notice is where this weather radar is located, and that’s at the crosshairs in the middle of the image. It’s, umm, Abbott Point, and what’s there? Why the huge new coal loading port of course, and where the Adani coal will be leaving from. the port purchased by Adani on a 99 year lease for $1.83 Billion. Those greenies will be all concerned looking on the outside, you know, the seeming, but you can bet they’ll be cheering on the inside, and in private. I can almost see the headlines now if Abbott Point gets damaged in this big blow. Tony, if the Abbott Point terminal or any other major North Queensland infrastructure can’t withstand a cat 5 cyclone then there should be some serious bum kicking going on. Then again the idiots who managed to use the contents of Wivenhoe dam to flood Brisbane have completely avoided any sanctions. I tell you what, though, the coral doesn’t like cyclones much. Well not the stuff near the surface anyway. Oh, and of course there were no cyclones before this year so it’s all the fault of CO2, except for the cyclones which happened before there were no cyclones. So it must be global warming which has caused the dramatic increase from 0 to 1 cyclone to cross the Qld coast this year. Interesting that my post ended in moderation. I wonder why? The comment filter which I think is a WordPress issue used here can be a bit psycho in its “into the moderation bin” for some posts. Patience is a virtue with the moderation around here so don’t panic as with a bit of luck a Mod or Jo will be along to clear the bin out sometime and your comment will get the appropriate treatment. Forrest, when you use a word like “bum” the filter puts you into a safe space. You need to give it a trigger warning. It’s a post-modern, sensitive snowflake, didn’t you know? It attended a modern day university and it drinks latte and bottled water. Any major damage to that coal loader is the Queensland Government’s biggest nightmare, and no matter how concerned they show themselves to be on TV, I’ll bet they won’t mention the coal loader. Let’s hope it all goes well for all those people in this area. I actually DO know how they feel. Lets hope those structures all hold up. The Greenies aren’t that smart… sure they’ll be cheering quietly on the inside, but only because it’s an ‘Extreme Weather Event’ that will be hyped to confirm their greatest hopes and worst fears all at the same time. For the life of me, I can’t figure how a group so fearful of a thing will deny all evidence the thing is not to be feared. A bit off topic Tony or any reader please,is there any reliable information on the best way to generate base load power for the future,HELE Coal fired generators seem to be the way to go.Burning natural gas seems to be an expensive way to generate electricity, the Channel Island power station in Darwin NT has been burning gas for at least 20 years at a somewhat expensive rate for consumers,but at least it is reliable. HELE coal fired generators are the way to go, hence the hysterical campaign against them and the retention of anything that hinders them, like the RET. You might also factor in that the big oil and gas companies aren’t keen on competition either (which is why they donate to the Greens). We have more than enough coal to run on for 100 years, but I think that is unnecessary with the advances being made in new nuclear processes. These are yet unproven in large scale application and economics so coal is the obvious solution until they are proven. So we need to start building HELE power stations and be prepared to run them for 40 – 50 years to get the best economics. Then we would have the choice of which nuclear process, or possibly several, to choose. Sadly I don’t think it will happen as the Green propaganda machine will go into action claiming that renewables plus storage will work. They won’t, but in the next 2 years we will see politicians dither and avoid any other decision. so a lot of taxes will go down the drain. After the next 2 summers with blackouts and rising electricity bills I think many people will be thoroughly fed up and angry with both major parties. By then we will have had State elections in Qld, SA, Tas. and Vic. with possibly all 4 governments being tossed out. 2019 is when the fan gets hit as both the NSW and Federal elections are due about the time when people realise that they have been lied and lied to, and have paid out lots of money for no reason. I think that for all his claims which he is bound to make about fixing the problem that Bill Shorten won’t become PM. He will go down with the ship ‘renewables’. Who will be the Liberal Leader standing on the sinking ship? Don’t know and frankly no longer care. I am now thinking that Cory Bernardi’s decision to leave the ship is a wise one and hope his new party is ready to win the election against the left wing liars who will be claiming that they will defy the capitalists (as they always do). If you want to see the future look at Greece, the economic mess there and the lowly unimportance of what were the major parties. Quite a good summing up there Graeme No3. The greenie game could be over by 2020 as they are beginning to lose a lot of power and influence and members in Germany which is the heart of the most extreme green operation. Some greens in fact have begun a fairly decent back lash against the wind and solar industry in Germany due to the incredible destruction of Germany’s treasured forests and wild life by the rabidly greedy wind industry in Europe. Another leftist party — the ecologist Greens, possible candidates for a future “red-red-green” national coalition — meanwhile scored less than five percent, meaning they missed the hurdle for parliamentary representation and were kicked out of the state assembly. CDU secretary general Peter Tauber said the outcome was “a clear rejection of red-red-green”, including at the national level. “In uncertain times, the people trust in leaders and political forces that govern in a dependable way,” he said. The anti-immigration and right-wing populist Alternative for Germany (AfD) party just scraped in with six percent, meaning it is now represented in 11 of Germany’s 16 state assemblies. If you want to go to about 2027 Griffo then have a read of the Nuscale modular reactor . Up to 12 of these 700 tonne, transportable just, modular reactors can be linked into a major concentrated generation complex. Nu scale are working very closely with the American nuclear regulatory authorities and have just submitted a 12,000 page application for a license which due to the close co-operation with the Nuclear agency during their whole of the reactor’s research and development, they expect to get a license to build the first prototype full scale operating module reactor by around 2020 with commercial production in factory and transported to the site around 2027. These reactors are sealed and passively controlled requiring no human interaction to remain within their design limits re temperatures, reactions and etc so there is no chance of a runaway reaction beginning. The modules are hauled out of their pits after around 20 years of generating power and returned to the factory be refurbished or scrapped depending on condition. A new or refurbished module is installed in the same pit and that would only take a few days in all probability . The real advantage is a distributed generation of power but still using the same grid system with a number of locations where the modular reactors have been installed,. And that may be of a very big benefit if there was ever an attack or major earth quake or whatever which today made against one of our major power stations which would take out most of our current generating capabilities. I live in Sydney but I don’t trust ANY power supplier to maintain my energy supply any more. OK thanks everybody esp Gno3,I think I might go down Bunnings and buy a generator capable of running the fridge and a couple of lights. I was pleasantly surprised at the low power requirement for a modern fridge 200w or thereabouts. Griffo, Remember the starting current can be 10x running current, especially when you have to turn over a compressor from a standing start. I wonder how the Barrier Reef is faring, Tony? Mosomo , Dangerous dan is practicing his ” with the benefit of hindsight ” speech and getting tips from his comrade Jay . Well, Weatherdill has blamed the Federal Government, the AEMO, the weather, Pelican Point for not doing the impossible, the Grid operators, the Liberals for selling off the grid in 1998, and a few excuses I may have missed involving unicorns and flying pigs, so blaming the Russians is the next step. Unfortunately Putin won’t take the slightest notice so Jay is safe from elimination. From Putin who wouldn’t waste his breathe. But the slow learners in South Australia are sick of eating cold crow. Whether he likes it or not, Weatherill going to be eliminated. I wonder how the generator sales have been going in Vic over the last month? I’ll bet the 2kva handbags are selling at a premium. I am not buying my generator just yet. Better and more powerful units may be available as the squeeze gets better. In the mean time, and for readers of this blog only, consider having 3 phase power installed to your property. And buy some extension cords. Why would 3 phase power be an advantage ? There is 3 phases in every street where I live and all the houses are balanced across the phases. If the power goes off, all 3 phases are gone. Sometimes when power outages are required they shut off one phase, then another.In other words they black out 1/3 of the street. If you have Three phase you will have some power. Nothing to do with it, 3 phase produces a naturally rotating magnetic field in motors with smooth power delivery. You can’t do really big motors with single phase because the power pulsates over the cycle. Its rhythms have shaped their lives for decades. Those who labour beside them have become family. In Victoria’s Latrobe Valley, hundreds of workers prepare to farewell the place that’s been their lifeblood. Photo: Dave Andrew, 64, is facing the loss of his workplace of 34 years, and forced retirement. Jane Cowan is a photojournalist based in Melbourne, where she works on digital storytelling for ABC News. From 2010 to 2015 she was one of the ABC’s North America correspondents, stationed in Washington DC. In 2015, she was part of the Foreign Correspondent team that exposed an unscrupulous surrogacy operator exploiting women in Mexico and defrauding American couples — an award-winning investigative report which was subsequently followed by the New York Times on its front page. But it was in country New South Wales, on Queensland’s Gold Coast and in the Northern Territory that Jane cut her journalistic teeth. On Black Saturday in 2009, she was the first television reporter into the destroyed town of Marysville where many of the bushfire’s 173 victims perished. Her coverage of the devastation and the resultant inquiry won multiple rewards, including for sensitive reporting of traumatic events. Over her 15-year career, Jane has reported for the ABC from India, Argentina and Mexico as well as across the United States. With a degree in social work and undertaking a masters degree in photography, Jane was recognised as a 2016 finalist in the documentary/photojournalism category of Australia’s Top Emerging Photographer awards. She spent the summer of 2016 photographing and telling multimedia stories at newspaper The Virginian-Pilot. Her interest is in the power of photography to move audiences and get beneath the surface of stories. You’re not serious are you? shameless Clive Palmer, Adam Bandt & Bill Shorten. Energy Minister Josh Frydenberg revealed on Monday he and Resources Minister Matt Canavan had met with people interested in investing in new technology high-efficiency, low-emissions coal power plants. “They are a long way off from confirmed commitments and clearly those discussions will continue,” Mr Frydenberg said in Canberra. Coal and gas would continue to play major roles in future energy generation, along with renewables supported by storage. Meanwhile, Greens MP Adam Bandt suggested the prime minister would have blood on his hands if the commonwealth subsidised loans for new coal-fired electricity generation. “If Malcolm Turnbull uses scarce public money to build a new coal-fired power station, he’ll have blood on his hands,” Mr Bandt said. Labor leader Bill Shorten criticised the link, saying it did a disservice to the people of north Queensland who are bracing for the impact of Debbie. The closure is expected to devastate the Latrobe Valley economy. Dr Karl refuses to debate Sen. Roberts. After agreeing to debate, Dr Karl is running scared. With a jaunty little tip of his tin foil hat, Malcolm Roberts has declared victory over “climate alarmists”, after triple j’s Dr Karl Kruszelnicki knocked back his offer to engage in a pointless public debate about the science of global warming. The One Nation senator, who has previously claimed on national television that NASA is cooking the books on climate change, has been asking Kruszelnicki to debate him since November. The famed scientist, author and broadcaster initially agreed, but apparently thought better of it after meeting Senator Roberts in person. looks like a complete rout by Malcolm Roberts to me. Dr Karl is fleeing the debate.! Karl must have started looking for evidence for his case. Karl has broken out in little red spots. He needs to see a doctor. MarkM, Dr Karl only believes what the alarmist scientists tell him , he does not check facts or figures just the mantra , and if they say the sky is green the sky is green , I hope they never tell him to jump off a cliff . Dr Karl who appears regularly on the ABC, was on with his new buddies Wil Steffen and Mick the Hockey Stick Mann playing ‘yesman’ to all the CAGW BS they were coming out with……Twas truly sickening ! Simply a conglomeration of duds group thinking on our forced taxpayer funded state propaganda monstrosity. Boy does that outfit need a haircut…..in the 100% range ! Clyclone Debbie is now approaching the coast somewhere between Bowen and Hamilton Island. BOM has siad that Debbie is now a category 3 cyclone and is predicting that it will be category 4 when i hits the coast about 9 am tomorrow. BOM says that Debbie is now Cat 3. It seems to be moving to a landfall just North of Hamilton Is. Debbie has snuck in between the BOM stations, so no station so far has seen the eye of the cyclone. Hence the BOM current strength and prediction is based on modelling. Ever wondered why there is a distinct lack of wind plants in Queensland. I dunno. I thought these wind plant entrepreneurs had some cojones. I guess that the Insurance Companies had a say in it, eh! A very interesting observation, Tony. A few more fires in midsummer around here in SE Australia from wind turbines lighting up, nacelle fires being the second major danger of wind turbines next to blade throw, and those fires have occurred but been hushed up in the media, and the insurance companies particularly here in SE Australia with its notorious reputation for being one of the most dangerous fire prone areas on the planet, the insurance companies might just say enough and pull out of insuring wind turbines. Even the politicals might get real bloody nervous if that happens and they fail to force the wind industry to cover any eventualities that might lead to serious death and destruction, particularly if the wind and solar industries are seen as being on the down hill run to eventual oblivion. Our data clearly shows that blade failure is the most common accident with wind turbines, closely followed by fire. This ignores the higer temperatures in Australia, which increase the likelyhood of fires. Some time ago I was forced to back down in a claim that there was a fire in SA south east because I couldn’t find a link, despite extensive time with Google. I have since tracked it down to 2006, Lake Bonney wind farm and 8,000 hectares burnt. $750M to keep 1/5 of Australia’s energy supply running, or $2B to maybe build an inferior system in maybe …. 5 years. We are indeed governed by idiots. Is the work of political clots. This interview was conducted by Simon Evans on 22 March 2017 at the World Coal Association’s office in London. CARBON BRIEF: You mentioned renewables. We’ve had comments from people like Piyush Goyal, India’s energy minister, saying that solar’s now cheaper than coal. We’ve talked already about low utilisation rates, which can only make coal more expensive to run. Do you think coal is the cheapest way to bring power to people without? As your electricity grid fails and industry holds on to the myth of an ever-growing coal export industry, Australians must draw a line in the sand and decide whether they continue to support coal, or whether the future is renewable…. Last week a historic alliance of environmental groups (LINK) representing more than 1.5 million people launched the largest climate movement in Australia’s history. In my many visits there, I have found Australians to be ***obliging and deeply passionate about protecting their unique environment. Never has the contrast between the fossil fuel present and the clean energy future been in such stark relief. I now implore all Australians to take a stand – for the sake of the world’s climate – to ensure this mine never goes ahead. wonder who gives the $$$ to McKibben’s 350.org? The left is very good at what they do. Some years ago Northcote Parkinson wrote a small book postulating that most history was a piston movement between the “East” and the “West”. The theme today might be a piston between the “left” and the “right”. Crudely, the “right” invests, builds, and saves, while the “left” spends, redistributes, and destroyed. destroyed in a mindless fury to make way for the unproven new. In Keynes world, governments saved in good times, and spent in bad. In the world of the left, or perhaps just the governmentally oriented, spending is endless. such that any recovery, if and when it comes, is more gangsterism that capitalism. industry and prosperity due to energy shortages and the inability to deploy capital profitably. One hopes for Aus sake that some of the assets are mothballed rather than destroyed, maintaining the potential recovery. As we plunge toward year zero, watch and learn from this guy about primitive technology. He is from Queensland and makes everything from first principles, he starts with no tools whatsoever. Watch it while we still have electricity. Note he has a number of videos in his channel, including the smelting of iron. At 7am Tuesday morning, Hazelwood is generating 630 MW, down from 1150 MW this time on Monday. But wind generation in SA has dropped to a tiny 29 MW so the lights are still on in SA thanks to 670 MW coming from Victoria. To meet that demand, Vic is importing 130 MW from Tas, and 140 from NSW, which in turn is getting 590 MW from Qld. Watch this space as that final 630 MW from Hazelwood is switched off. Not surprisingly, prices are high – $195/MWh in SA, $138 in Vic. I got my electricity bill today. The actual electric cost was US$28 per MWh. About $37 AUD per MWh. Including delivery to my meter cost $105 per MWh ($137 AUD). This costs includes the fixed monthly service fee plus transmission fees. How does Australia expect to compete with the rest of the world paying these energy costs? I am glad that I left for the United States. What will the power situation be like during the next drought in mainland Australia? How much was the Snow Hydro scheme generation affected by the last drought? Combine that with a water shortage in Tasmania? Now down to 500 MW, slowly fading into the sunset. Cyclone Debbie at 7am EST: thousands of people have been evacuated as the storm cell closes in on north Queensland. It has been upgraded to a Category 4 Cyclone. Hamilton Is. Wind 156 km/h, gust 196 km/h. Bowen. 50/67. Peak expected at 10-11am. A Category 3 cyclone’s strongest winds are VERY DESTRUCTIVE winds with typical gusts over open flat land of 165 – 224 km/h. A Category 4 cyclone’s strongest winds are VERY DESTRUCTIVE winds with typical gusts over open flat land of 225 – 279 km/h. Debbie is then expected to weaken to a Category 2 system about 5pm on Tuesday, after it passes an area near Collinsville and Bowen. Now Debbie is here the media have a distraction , women have a habit of doing that . And here’s another . . . . . I laughed so hard after reading this article. Here we have people expecting to become rich and famous, living off the grid, for a reality TV program…Meanwhile they are being trumped by the Trump reality show. This comment is a response to a long thread back a few days but is relevant to what’s happening to our power generation because it is the excuse used by all and sundry for their behaviour. I hope I have shown that Human Origin CO2 is irrelevant to the Greenhouse Effect, if it exists. We must never lose sight of the basic issue; the claim that human origin CO2 causes global warming. In my posts previously there has been a focus on looking at the claims and assuming they were correct ( i.e. IR absorption by CO2 at just above ground level) and then walking through some of the implications. See my post IF. If the greenhouse effect is real. The Warmers do not measure things but refer to complex equations from text books which most often are describing laboratory conditions and not nature, the S-B equation is a case in point: it requires careful “priming” for use in the real world. All the evidence points to the fact that no such priming has been done nor is there any awareness that it is required. The problem with the system we are examining is that it is almost impossible to actually measure things to the level where equations can confirm or deny a claimed mechanism. There are too many extraneous factors and unknowns and isolating the relevant factors is near impossible. The term “greenhouse effect” is not a scientific term because it has too many ifs, buts and maybes, but it is useful in sending us to examine or look at roughly the right area of interest. Back radiation may exist but we are concerned here with quantifying effects and by any logical analysis the virtue of such returning radiation in the depths of the night in cold places must be very low or almost negligible. 1. UV comes through the atmosphere and is absorbed by ground ocean etc and degraded. 2. The original degraded UV is emitted from ground, ocean or whatever surface it originally hit, as IR and other wavelengths. This is the low virtue energy supposedly absorbed by greenhouse gases. 3. At our surface the average temperature is approximately 288 degrees K . If CO2 is already at or above the specific temperature involved in the IR Spectrum, it may not be able to absorb any more low virtue energy from the ground, such energy would then continue on towards space. b. Total CO2 is 3%, and of this, approximately 4% maybe of human Origin. So, human Origin absorption, if it actually occurred, is 3 x 4 over 100 which comes out at 0.1 2% of the total effective greenhouse effect. We can use this to examine a warmer claim. If this greenhouse effect is actually working, and I’m not sure it is, then for example consider the global warming since the 1850. Temperatures have risen by about 0.6 degrees C so that we can ascribe 0.6 x 0.12 % of 0.6 C deg which equals 0.00072 C deg as humanitys share of this. Really. You mention 388 watts per square metre of surface emission and average surface emission of 240 watts per square metre and then derive back radiation by subtraction. I am curious to know the actual measurements obtained for the three items mentioned do you have any. First surface emission, then average surface mission and last back radiation. The idea of finding back radiation by subtraction ie. looking at basic inputs and outputs is fraught with perils of the unknowns. I hope that my summation of the human input is reasonable; if it is it certainly points to some serious issues with decision making by the worlds self appointed intelligentsia. Simple, sensible, logical. Thank you KK. “a. Water is …………………………..share of this. Really.” Absolute gold. The point is that whether or not the GH Effect is real or not, a simple quantitative analysis shows that the human contribution is irrelevant. They know this and try hard to cover it up. The current issue is that excellent power generation plants that that would be welcomed by billions of people in India, China and Africa are being demolished here in the Lucky ? Country. Crazy and wilfull behaviour. A major US ice-cream brand is sponsoring a campaign protesting against Queensland’s proposed $21 billion Adani mine, hosting anti-coal events in Melbourne, Sydney and Canberra. Government MP George Christensen yesterday called for a boycott of Ben & Jerry’s and ­accused the ice-cream company of hypocrisy and urged Australians to “tuck into some locally manufactured ice-cream” rather than the product which is imported from Vermont. An Amnesty International report in November found it was “highly likely” that Ben & Jerry’s parent company Unilever, which confirmed to Amnesty that it sourced palm oil from agribusiness giant Wilmar’s Indonesian operations, “are sourcing palm oil produced on plantations where palm oil has been directly supplied or, at the very least, been mixed with palm oil produced on plantations where there are severe labour rights abuses”. “Ben & Jerry’s are telling us we’re living our lives in sin by making money for our community while (their parent company is) sourcing part of their product from Wilmar which is making life tough for farmers in Queensland, but also engaging in practices around the world which are questionable,” Mr Christensen said. ***have we found one of the financial supporters of 350.org? Hope Australia doesn’t pull an Ontario, Canada, Electric rates through the roof for a politically correct save the planet scam. $ Billions wasted and intergenerational debt now being orchestrated to try and save the Liberals leading up to a Provincial election. The easy part is they are done but the train wreck they left behind lives on. These people should be in jail for facilitating a fraud and selling their citizens out. Not to worry though they will be well taken care of. Politicians make lot lizards look good . So, Prime Minister Turnbull announces an Inquiry in the rise in costs for generating electrical power. Australia has closed 9 aging coal fired power plants. Hmm! I wonder if there’s a clue there. Australia has increased the number of wind plants. Hmm! I wonder if there’s a clue there. Australia has increased the number of solar plants. Hmm! I wonder if there’s a clue there. Australia has a rapid uptake in rooftop solar with the very very high FIT. Hmm! I wonder if there’s a clue there. The White House will release its executive order on the Clean Power Plan tomorrow, triggering President Trump’s promises to dismantle the climate policies of his predecessor. This is a response to an earlier comment you made about wanting to know of any proposed wind farms. One is to be put in place in the southern Flinder’s Ranges in South Australia just north of Crystal Brook unless it can be stopped. Look forward to seeing what you discover. Oh Tony…surely not! /sarc (was that really needed?). While Mr. Trump has yet to formally pull out of the Paris deal — a nonbinding agreement with no enforcement mechanisms other than public shaming — his move Tuesday essentially guarantees the U.S. won’t meet the ambitious target. “There will be some advantages for other countries and there will also be extraordinary disadvantages,” if the U.S. ends up quitting Paris, said Christiana Figueres, an architect of the agreement who was the U.N.’s climate chief in Paris. “The Achilles heel of the Paris Agreement is that it’s built on consensus,” said Johan Rockstrom, director of the Stockholm Resilience Center at Stockholm University. “It’s very difficult to have a negative giant in the room” able to obstruct all decisions, he said, adding that he had swung in recent weeks to reckon that a U.S. pullout would be better overall from an earlier view that it would be a “big failure”. A senior White House official said that outright withdrawal from the Paris Climate Agreement was still “under discussion” in the administration. On Thursday, Soon cited a 1969 article by the New York Times, referring to it as a “fake news” outfit, which reported back then that sea ice in the Arctic would disappear by 1988 due to climate change. Hmmm. I think the Vic government are trying to ‘hide’ the effect of the closing of Hazelwood? Some things I have noticed, prior to Hazelwood beginning the shut down. I believe Newport was off line, I’m pretty sure Mortlake was offline. Now both these plants are operating! They are both gas fired plants. Between them, I think they have over 1000 MW of capacity. One other thing I have noticed that has me a bit intrigued, is that the Macarthur windfarm was peaking at 50% capacity, and flatlined at that point. Meantime, the other state windfarms were performing their usual up and down dance! Macarthur has now dropped, along with the other windfarms, to around 12% of plated capacity! So, I guess my question is, is the Vic government now going to rely more heavily on gas fired power production from Newport and Mortlake? Hazelwood #1 & #3 are still operating, producing 330 MW, about 85% of nameplate capacity. And yes, over the last 24 hours, Newport and Mortlake gas stations have operated at max capacity of 1000 MW during the morning and evening peak demand periods. So here’s hoping we have enough gas supplies in mid winter, even if it is expensive. Victoria has many other natural gas generators at Bairnsdale 94 MW, Somerton 160 MW, Jeeralang (Morwell) 440 MW, Laverton 600 MW, Valley Power Peaking (Traralgon) 600 MW, mostly on standby. 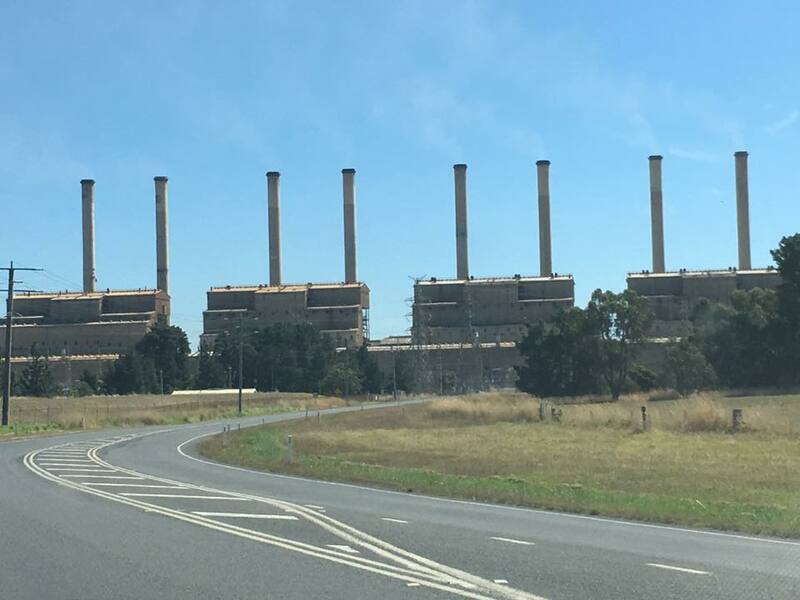 Yallourn and Loy Yang coal stations are producing a consistent 3500 MW, with two units at Yallourn and one at Loy Yang not producing (capacity 1000 MW). So the lights aren’t going to go out today. It has been pointed out the outright misinformed bias by MSM which is quite right, but what is the source? The source is the liberal left education system starting from the first day of school. How many pay attention to what their kids are being taught in school. Walk into any university and everyone is walking around like zombies with smiles permanently etched on their indoctrinated faces. Look at the education system. These are crazy times we live in and this Mark Steyn talk about sums it up. Applies to my criticism of the education system. Have a listen it does apply to the idiocy of shutting down Hazelwood. I have visiting Anero.id quite a bit lately! Here is Newport for all of March. Was mostly not used at all, until the Hazelwood shutdown! I suspect this is what our local gubbermint meant, when it said we have sufficient generating capacity. It’s certainly not in wind power! And when there is a drought in Tasmania, then what ? It seems the South Australia model is the one they wish to emulate.